H2: At the media timeout, U-M trails 46-45. @moritz_weasley leads the team in scoring with 14, followed by @zirvin21 with 12. Wisconsin and Michigan tied at 47 with 8:20 remaining. Happ 22 points on 10-for-11. Trice 5 points on 2-for-12. I don't really know how to describe the last sequence by Khalil Iverson, so I'm not even going to try. Abdur-Rahkman hits the 3 and is fouled by Trice. 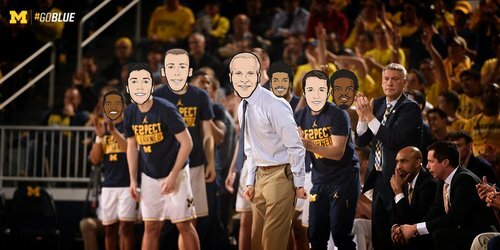 Michigan will get a FT on the other side of the timeout. Abdur-Rahkman has 11 points and can complete a four-point play when play resumes. Michigan up 50-47, 7:51 left. Miscues killing #Badgers : Iverson misses contested drive + fouls. Then Trice fouls on 3-pointer. UW down 3 w/7:51 left. Oh boy...MAAR hits a three and gets fouled by Trice. Michigan up 50-47 and on the line after the timeout. Michigan on a 9-0 run and leads 54-47 with 7:05 left. Six consecutive empty possessions for UW since Showalter's three-point play. Lead gone, momentum gone. Walton Jr for 3 and #Badgers are down 54-47 with 7:05 left. Things are not looking good for 'ol University of Wisconsin men's basketball. Michigan on a 9-0 run. H2: @zirvin21 adds another Michigan THREE to the board and U-M leads 54-47 after going on a 9-0 run with 7:05 to play. GET LOUD! Thought Brevin Pritzl might be a factor with Bronson Koenig out. Has he even played? Hill ends a run of seven straight empties with a 3-pointer. Jordan Hill for 3... SPLASH! ???? Lead is down to 4. Nigel with a huge block and then JORDAN HILL (????) FOR THREE! Badgers down 4. #Badgers Trice has 5 boards, 4 assists and 2 TOs but is 2-13 shooting. Despite having made 1 of their last 8 FGs, the #Badgers trail by just 2 possessions late. H2: Michigan timeout. The Wolverines lead 56-50 with 4:52 to play. Fourth foul on Happ with 4:29 remaining. Gard leaving him in. Happ misses a bunny, makes it worse by picking up his fourth foul 80 feet away from the basket. Wisconsin with only three points in the last seven minutes, seeing a 47-45 lead turn into a 58-50 deficit with 3:18 remaining. H2: @moritz_weasley WITH THE DUNK!!! U-M leads 58-50, 3:14 to play. Getting dunked on by a German not named Dirk Nowitzki is bad, IMO. The #Badgers are down 58-50 with 3:14 to go. No Koenig to save them. Who will step up? Zak Showalter hits a pair of free throws. #Badgers back within two possessions. Showy hits a couple of free throws to cut the lead to 6. Chipping away, baby. Wisconsin shooting just 38.1 percent in the second half.with six turnovers. Badgers have scored only 5 points in the last eight minutes. H2: Why not add another? @zirvin21 DUNKS one to make to 60-52 with 2:20 to play. WELP, Zak Irvin just dunked on the Badgers and I think the rest of the season should just be cancelled. Moe Wagner hits the dagger three and everything is awful. U-M leads 63-54 with 0:55 to play. The last time Wisconsin hit a FG Ethan Happ probably didn't have a foul. H2: Michigan leads 63-58 with 8 seconds left in the contest!